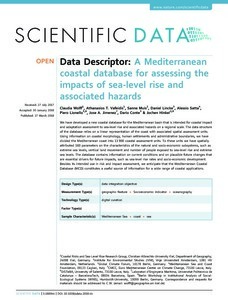 We have developed a new coastal database for the Mediterranean basin that is intended for coastal impact and adaptation assessment to sea-level rise and associated hazards on a regional scale. The data structure of the database relies on a linear representation of the coast with associated spatial assessment units. Using information on coastal morphology, human settlements and administrative boundaries, we have divided the Mediterranean coast into 13 900 coastal assessment units. To these units we have spatially attributed 160 parameters on the characteristics of the natural and socio-economic subsystems, such as extreme sea levels, vertical land movement and number of people exposed to sea-level rise and extreme sea levels. The database contains information on current conditions and on plausible future changes that are essential drivers for future impacts, such as sea-level rise rates and socio-economic development. Besides its intended use in risk and impact assessment, we anticipate that the Mediterranean Coastal Database (MCD) constitutes a useful source of information for a wide range of coastal applications. Wolff, C., Vafeidis, A., Muis, S., Jimenez, J.A. A Mediterranean coastal database for assessing the impacts of sea-level rise and associated hazards. "Scientific data", Març 2018, vol. 5, p. 1-11.